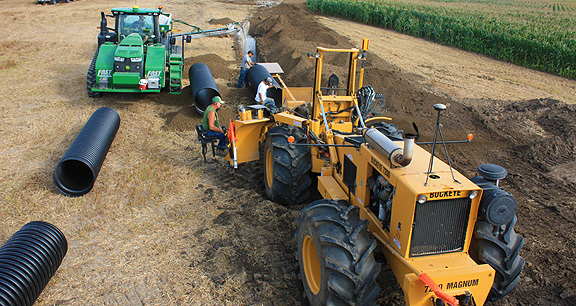 Project obstacles and solutions: L&W Excavating was putting in a new underground drainage system in farm fields in Fairmount, Indiana. They were using a trencher with an in-ground box tile layer to place both 30 inch and 24 inch PVC tiles. This replaced an aging clay tile system that was installed in 1907. Twenty farmers formed the cooperative, Grant County Tile, to replace the aging system. The main line of the new system covered 5,000 linear feet, with sub-main arteries covering 4,800 linear feet. The drains improved flood controls and increase usable farmland. To make all of this work, an aggregate filter bed was placed around the tiles before burying them. This served as both a support and an erosion control. IMI Aggregates provided 3,000 tons of filter bed materials for this project. IMI met with L&W to discuss the best products for stability and erosion control. The 30 inch tiles served as main drainage lines. They needed the support of subbase materials to maintain their rounded shape. IMI suggested a Number 8 Limestone be used on these larger tiles. Crushed limestone compacts well to provide a firm base and it is small enough to fill in the fissures surrounding the pipe. Number 8 stone is washed prior to delivery, so dust and fines are eliminated from the stockpile. This was important to keep the 1/4 inch holes in the plastic tile from getting plugged up by finer material. The stone was placed one foot over the pipe to allow quick water flow to the tiles while holding the soil in place. This helps eliminate soil erosion from water runoff. The 24 inch tiles were placed as sub-main arteries that gathered water. They used perforated pipes that needed an aggregate filter bed for erosion control. Due to their smaller size, they did not need the structural base of the larger tiles. IMI suggested using Number 8 Gravel since it has rounded edges that provide larger voids between the aggregates. Groundwater can then flow freely to the smaller arteries of the drainage system while trapping soil outside the pipe. L&W followed their trencher with stone cart and conveyor system to provide a good covering of the aggregates. For more information on aggregates, gradations and their application in your projects, contact the sales representative for the quarry nearest your location. Click here. Watch L&W placing the tiles.